When Thomas wakes up in the lift, the only thing he can remember is his first name. His memory is blank. But he’s not alone. When the lift’s doors open, Thomas finds himself surrounded by kids who welcome him to the Glade, a large, open expanse surrounded by stone walls. Just like Thomas, the Gladers don’t know why or how they got to the Glade. All they know is that every morning the stone doors to the maze that surrounds them have opened. Every night they’ve closed tight. And every thirty days a new boy has been delivered in the lift. Thomas was expected. But the next day, a girl is sent up, the first girl to ever arrive in the Glade. And more surprising yet is the message she delivers. Thomas might be more important than he could ever guess. If only he could unlock the dark secrets buried within his mind. All he knows is his name is Thomas and he's just been dropped into a world of the unknown. The Glade is surrounded by four ivy clad stone walls, with four openings to indicate each compass point. Along with fifty other boys ranging from barely to late teens, The Glade functions as a small self sufficient society, with the occasional hand from the illusive Maze creators. Everyone has a position to fill, from the kitchen staff to the runners that venture out into the Maze beyond the doors each day. But at night, the Maze becomes a death trap. Each night the walls shift, locking out anyone still caught within the Maze, and keeping the rest of the community safe from the Grievers. Half mechanical, half slag like creates, but on a much bigger scale. The boys are monitored through the use of mechanical spies, but still no one knows what lies beyond the walls. The only glimpse into their former memories comes at the hands of the Grievers, boys who've been stung in the Maze going through what they've labelled the Transformation, a state in which hallucinations allow memories to resurface. And it seems they've seen Thomas before. As Thomas begins to settle into what is seemingly his new life, another player is dropped into The Glade. A girl. Slipping into a comatose state, the girl calls for Thomas and brings with her an ominous note... She is the last one. But the last what? But the Maze is changing. No longer do the walls close in at night and the community is no longer safe. Thomas can feel the end fast approaching and begins to put together glimpses of a world he's seen before. Why have they been chosen and what is exactly outside the walls of the Maze? The Maze Runner is the ultimate no nonsense series. It's incredibly unique and relies purely on the depth of characters and world building, rather than the exhausted young adult dystopian cliché. Thomas who is believed to be sixteen years old, is dropped into The Glade, an self sufficient but frightening community of boys that seem to have accepted their fate. No one knows what lies beyond the Maze and most of the fifty strong community would rather not question why they're there, but are simply content to survive. The world created by James Dashner was phenomenal, and painted a vivid picture how how ominous and expansive the Maze is and the fear that looms over the community. Thomas is a reliable narrator, switching seamlessly from third person perspective while still gaining an insight into his thoughts and fears. For a group of teens that retained no memory of their former lives, they were well developed and each with their own individual personalities. Within the community, the boys also have their own language and substitute names and colourful phrases for their own, reminiscent of Blood Red Road and Fire Country. The storyline is a mixture of intrigue and frustration as no one is willing to tell Thomas anything about The Glade or The Maze which may leave some readers despondent, but I thoroughly enjoyed it regardless. The storyline springs to life shortly after the lone girl is dropped into the community, and murmuring Thomas' name not only raises eyebrows but suspicions amongst the other boys. Thomas isn't perfect as he focuses on learning what lies beyond the Maze, rather than questioning why. But what he lacks in curiosity, his tenacity, intelligence and bravery succeed him, not surprisingly making his character a fan favourite. It was simply brilliant. My only complaint is that I would have appreciated the storyline to have progressed further, perhaps including a few timely answers sooner rather than in the final few chapters. Regardless, it was incredible and I look forward to continuing on with the series and the movie adaptation as well. I can't wait for the movie either. Before reading it, the book trailers didn't interest me too much, but now? I'm completely obsessed and can't wait to see it. It's incredible being able to read it already having an idea of what The Glade and Maze look like, it was just incredible. Me too, it's honestly going to be epic. Thomas was a little dull overall, always feeling the need to do what was right and not wanting to upset the other boys within the community, but he was a worthy is not incredibly honest hero and I'm hoping he hardens up a little more as the series progresses. Fabulous review Kelly! I'm looking forward to reading this one before I go to see the movie, and it sounds like the characters are developed really well which is always a good sign. It's absolutely brilliant Eugenia and I'm annoyed that it took me so long to get around to reading it. I thought it would have been a little young, but I love my dystopians and this was incredibly worthy of being one of those well loved series. Definitely fit in a read before seeing the movie. 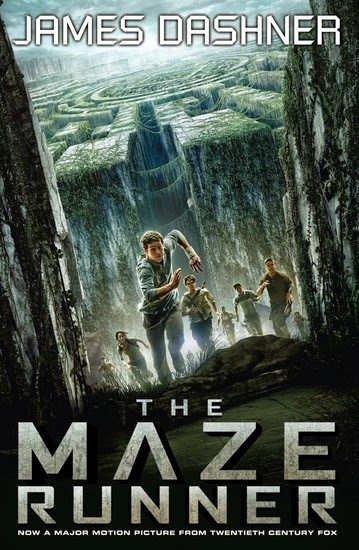 Ah I loved The Maze Runner and also the movie! You have to see it. I have to agree with you, a few answers from the start would have been great but I like how it's sort of meant to make you feel like Thomas as you're just as clueless as he is. I can't wait to read the next novel as I feel like the story-line is going to take a complete turn and it's going to be completely different from the maze aspect. Who knows! We'll just have to read it. I just read and commented on your movie review, I'm so excited to see it, especially after reading the book. I'm super excited to read book two, this one ended so epically, I can't wait to see what happens next. While I've seen this book around the blogosphere a lot of times, I never actually took the time to read the blurb and find out where's it's really about. I am glad to hear you thought it was original and I love well developed characters in a book. I really enjoyed reading your review and have added this book to my to-read list. Great review! Thanks Lola. I read it a while back and added it to my list but have wanted to read it knowing the film was being released soon. It's incredible! I can't wait for you to pick up a copy and see what you think of it. Thanks for stopping by. Wonderful review, Kelly - I'm so glad you enjoyed this! TMR has been on my TBR for what feels the longest time, and I still haven't picked it up. I hope to have read it before the end of the year, however. I actually saw a beautiful box set of the trilogy for only $19 in KMart - what a steal! I'm wishing I picked it up now. I'm glad to hear that all of the characters had their own personalities and I love the concept of having their own language within The Glade - that's awesome! I don't think I've read a book with that aspect in it before. Also, loving the new design, Kelly! I'm not a huge fan of pink, but it always looks lovely in your designs. I'm exactly the same, and I regret not having picked it up so much sooner. It completely blew me away. Wow, our Kmart only has what seems to be an abundance of new adult and grandmother romances, you should have grabbed it. You definitely need to grab a copy, it was absolutely brilliant. Thanks poppet. I love pink, but tried to keep it in small doses. Too much and I look like a demented fairy. While I didn't like this book at all, I am glad you liked it much better than I did! One of my problems was also that it was pretty slow and since the answers were left for the last few chapters, things felt draggy. The world building was pretty good too. I can understand how most readers probably had the same issue, it's really slow compared to other series and it takes a while to get into the action. That's actually what I enjoyed about it though, that it build up the world of the Glade and Maze, and also the characters as well before the real action began. I said that it wasn't cliche as well and that's what I liked about it! The different slang used in it did remind of Fire Country as well. Thomas was a really fantastic, albeit idealised, character to read about. Can't wait to watch the movie now. Great new design hun! I loved that there was no forced romance, I dreaded it and was thrilled when I realised it wasn't going to happen. I expected it to have a similar type feel to Michael Grant's Gone series, but it's incredible and felt more mature. Really loved it and can't wait to see the movie now too. I also really liked this book/trilogy and I can't wait to see the movie! Me too Finley, I can't wait to start on book two soon! Awesome review Kelly! I'm planning to read this soon, but I'm not sure when! I do really want to see the movie adaption too though! I'd definitely try to read the book first before seeing the movie, I've heard it's an incredible adaptation but being able to recognise characters and already forming that book bond with them will make for an awesome experience.